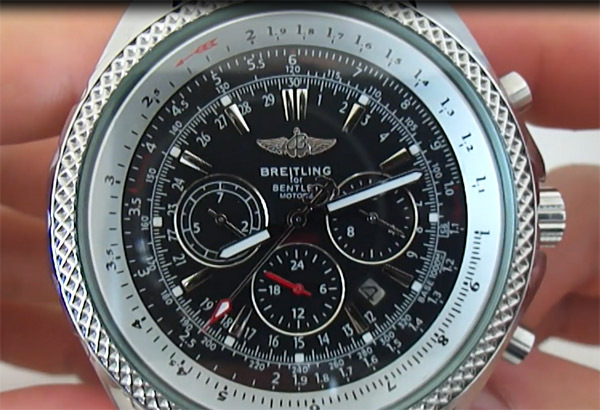 New Breitling for Bentley Motors replica watch review. Black dial, black rubber band, a very sporty Breitling replica watch that is well cloned and has the looks. Well done dial with well cloned markings. The chronographs are a bit off from the original and this is sort of a trend in the replica watches world. Not sure why they don’t give it that much of an interest to just make the whole dial look exactly like the original because it should not be that hard. That would be my only bash with this watch. The scratch-proof crystal is nice, wide and fits well the rotating bezel which has the Bentley Motors edge nicely done. Polished, good thickness stainless steel case looks great too and it houses a precise Japanese automatic mechanism. Breitling logo on the crown as well as on the seconds hand give a nice finishing touch to this fake watch. Rubber band is of good quality and the folding clasp has all the right engravings inside and out. Watch looks and feels great on the hand and it really catches the eye having that Breitling bulkiness. Enjoy the video and visit my channel for even more replica watches home made video reviews – they’re great!